Lanthanite: Mineral information, data and localities. 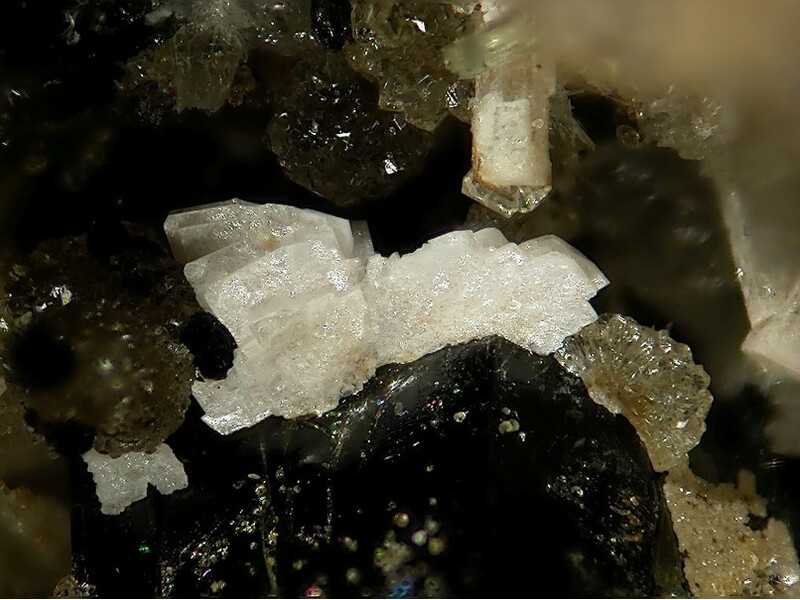 This page provides mineralogical data about Lanthanite. Shomiokite-(Y) 3 photos of Lanthanite associated with Shomiokite-(Y) on mindat.org. Berzelius (1825) Zeitschrift für Min. : 2: 209 (as Kohlensaures Cereroxydul). Berzelius (1824) Svenska Vetenskapsakademien, Stockholm, Handlingar: 134 (as Kohlensaures Cereroxydul). Hisinger, W. (1826) Versuch einer mineralogischen Geographie von Schweden. Translated by F. Wöhler. Leipzig: 144 (as Kohlensaures Ceroxydul). Dana, J.D. (1837) System of Mineralogy, 1st. edition, New Haven: 206 (as Carbonate of Cerium). Beudant, F.S. (1832), Trailé élémentaire de Minéralogie, second edition, 2 volumes: 2: 354 (Carbocérine). Hartman (1843) Min. : 2: 816 (as Hydrocerit). Dufrénoy, A. (1845) Traité de minéralogie, Vol. 2: 377 (as Cérium carbonaté). Haidinger, Wm. (1845a) Handbuch der bestimmenden Mineralogie. Vienna: 500 (as Lanthanit). Glocker, E.F. (1847) Generum et specierum mineralien secundum ordines naturals digestorum synopsis. Halle: 248 (as Hydrolanthanite). Blake (1853) American Journal of Science: 16: 228 (as Crystallized Carbonate of Lanthanum). Smith (1854) American Journal of Science: 18: 378. Genth (1857) American Journal of Science: 23: 425.
von Lang (1863) Philosophical Magazine and Journal of Science: 25: 43. Flink (1910) Arkiv för Kemi, Mineralogi och Geologi, Stockholm: 3: 165. Lindström (1910) Geologiska Föeningens I Stockholm. Förhandlinger, Stockholm: 32: 214. Goldschmidt, V. (1913) Atlas der Krystallformen. 9 volumes, atlas, and text, vol. 5: 119. Palache, C., Berman, H., & Frondel, C. (1951), The System of Mineralogy of James Dwight Dana and Edward Salisbury Dana, Yale University 1837-1892, Volume II: Halides, Nitrates, Borates, Carbonates, Sulfates, Phosphates, Arsenates, Tungstates, Molybdates, Etc. John Wiley and Sons, Inc., New York, 7th edition, revised and enlarged: 241-243. The following Lanthanite specimens are currently listed for sale on minfind.com. [Lanthanite-(Ce)] Vera Munro-Smith (2006) Cobalt Mineralisation in Selected Australian Deposits. PhD thesis, University of Western Sydney. [Lanthanite-(Ce)] Auer, C. & Kolitsch, U. (2017): Die Mineralien des Emmastollens im Ratteingraben bei Waitschach, Kärnten. Der Steirische Mineralog, 32, 11-21. [Lanthanite-(La)] G. Niedermayr, F. Brandstätter (1993): 904. Adular, Allanit-(Ce), Anatas, Ankerit, Aragonit, Calcit, Chalkopyrit, Dolomit, Galenit, Lanthanit, Pyrit, Pyrrhotin, Sphalerit und andere Mineralien aus dem Falkenbergtunnel in Klagenfurt, Kärnten. Pp. 269-272 in NIEDERMAYR, G., F. BRANDSTÄTTER, B. MOSER, W. H. PAAR, W. POSTL, J. TAUCHER & H.-P. BOJAR (1993): Neue Mineralfunde aus Österreich XIIL. Carinthia II, 183./103. : 265-290. [Lanthanite-(Ce)] SHEARD, E.R., WILLIAMS-JONES, A.E., HEILIGMANN, M., PEDERSON, C. AND TRUEMAN, D.L. (2012) Controls on the concentration of zirconium, niobium, and the rare earth elements in the Thor Lake rare metal deposit, Northwest Territories, Canada. Economic Geology, 107(1), 81-104. [Lanthanite-(Ce)] Sheard, E.R. (2010); SHEARD, E.R., WILLIAMS-JONES, A.E., HEILIGMANN, M., PEDERSON, C. AND TRUEMAN, D.L. (2012) Controls on the concentration of zirconium, niobium, and the rare earth elements in the Thor Lake rare metal deposit, Northwest Territories, Canada. Economic Geology, 107(1), 81-104. [Lanthanite-(Ce)] HORVÁTH, L. & PFENNINGER-HORVÁTH, E. (2000) I minerali di Mont-Saint-Hilaire (Québec, Canada) Rivista Mineralogica Italiana, XXIV, 140-202 (in Italian with English summary). [Lanthanite-(Ce)] Zhang Peishan, Yang Zhuming, Tao Kejie, and Yang Xueming (1996): "Mineralogy and Geology of Rare Earths in China", Science Press (Beijing), 226 pp. Sotka, P. 1984. Juuka, Panjavaara: Ce-La-Sr-mineraalien esiintyminen karbonaattijuonissa. Outokumpu OY raportti 070/4312 08A/PMS/1984. [Lanthanite-(Ce)] Remy, P., Gatel, P., Meisser, N. (2014): Indice à terres rares de Mosset (Pyrénées-Orientales). Le Cahier des Micromonteurs, 1-2014, 3-17. [Lanthanite-(Ce)] Gröbner, J., Hajek, W., Junker, R. & Nikoleizig, J. (2011): Neue Mineralschätze des Harzes. Papierflieger Verlag GmbH, Clausthal-Zellerfeld, Germany, 127 pp. 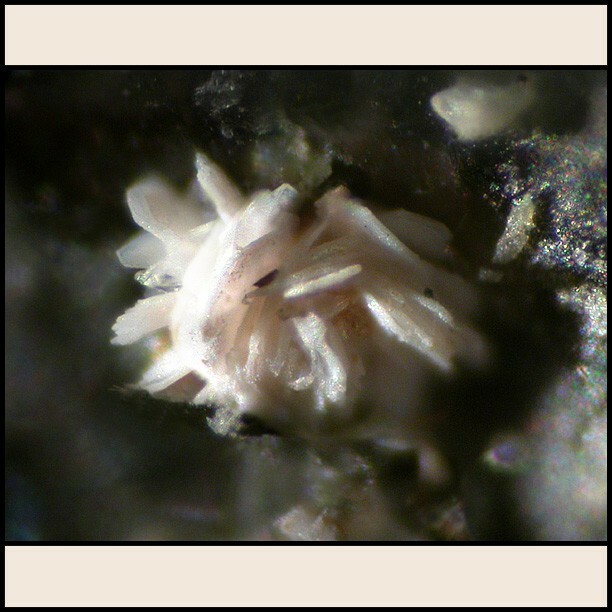 [Lanthanite-(Ce)] Bogoch, R., Weissbrod, T., Bar-Matthews, M. (1992): Significance of REE-mineral inclusions in aegirine from an alkali syenite, Negev, Israel. European Journal of Mineralogy 4, 1337-1346. [Lanthanite-(Nd)] American Mineralogist: 71(7-8): 1028-1033. [Lanthanite-(La)] Miyawaki, R., Matsubara, S., Yokoyama, K., Takeuchi, K., Terada, Y., & Nakai, I. (2000). Kozoite-(Nd), Nd (CO3)(OH), a new mineral in an alkali olivine basalt from Hizen-cho, Saga Prefecture, Japan. American Mineralogist, 85(7-8), 1076-1081. [Lanthanite-(Nd)] Graham, I.T., Pogson, R.E., Colchester, D.M., Hergt, J., Martin, R., Williams, P.A. 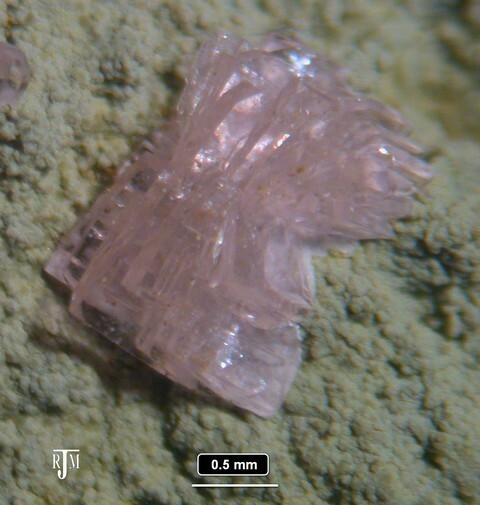 (2007) Pink Lanthanite-(Nd) from Whitianga quarry, Coromandel Peninsula, New Zealand. Canadian Mineralogist. 45:6, 1389-1396. [Lanthanite-(Ce)] Szakáll, S. & Kristály, F., Eds. (2010): Mineralogy of Székelyland, Eastern Transylvania, Romania. Csík County Nature and Conservation Society, Miercurea-Ciuc, Romania, 321 pp. ⓘ Stove Mountain (Cookstove Mountain) ? ⓘ Canton Mine (Rich mine) ? [Lanthanite-(La)] Dana 6: 767; Palache, C., Berman, H., & Frondel, C. (1951), The System of Mineralogy of James Dwight Dana and Edward Salisbury Dana, Yale University 1837-1892, Volume II: 242. [Lanthanite-(La)] Palache, C., Berman, H., & Frondel, C. (1951), The System of Mineralogy of James Dwight Dana and Edward Salisbury Dana, Yale University 1837-1892, Volume II: 242. [Lanthanite-(La)] Rocks & Minerals: 6: 26; Rocks & Minerals: 10: 33-36, 58. Handbook of Mineralogy - Anthony, Bideaux, Bladh, Nichols; Hess, F. L. 1908. Minerals of the rare-earth metals at Baringer Hill, Llano County, Texas. U.S. Geological Survey Bulletin 340. 286-294.